The Index opened strong around 8396 and went on to touch the highs of the day of 8413 within the first few minutes of trade but saw huge unwinding to the lows of the day at 8269. Bottom fishing saw the index close flat at 8341.40, loss of 0.75 points. The broader market was weak, with 585 advances to 927 declines. Developing Range as per Option Table is huge at 8100-9000. 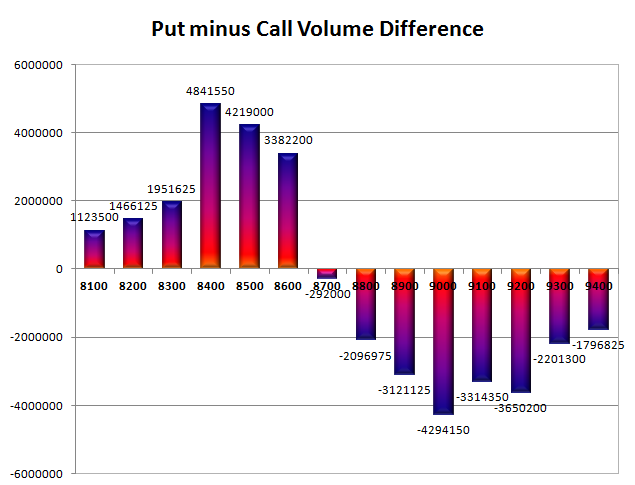 Call option 8200-9100 added huge 30.43 lacs OI. 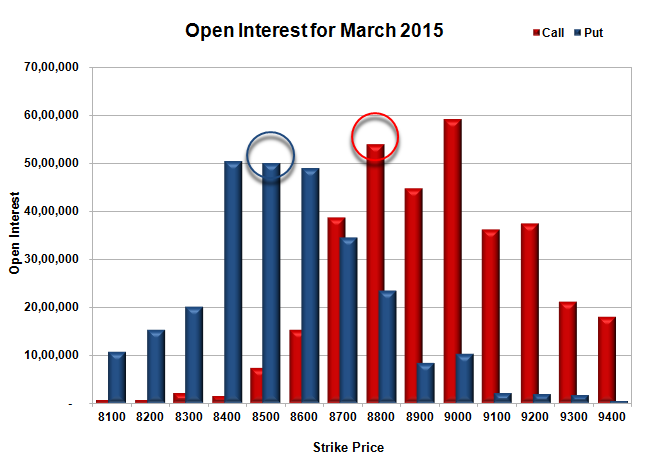 Put option 8400-7900 added huge 13.55 lacs OI with short covering seen at 8500 and above strike prices. 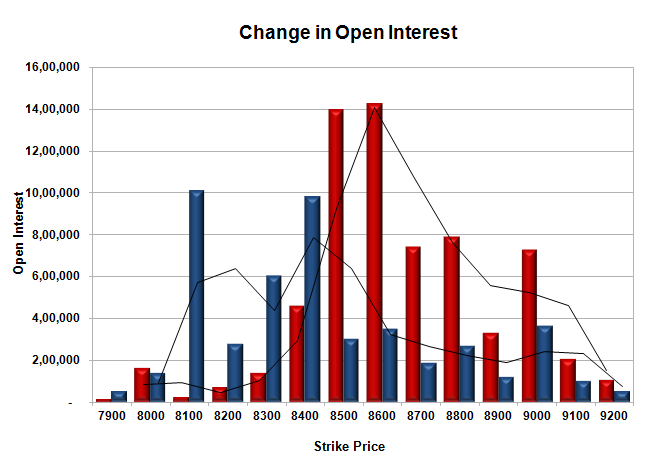 Nifty Open Interest is at 2,12,87,100 down by 5,50,750, with small decrease in price, most probably huge long liquidation. 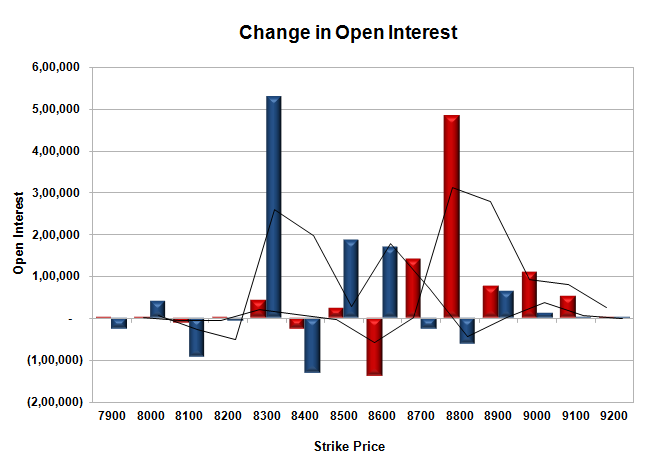 Bank Nifty Open Interest is at 21,48,950 down by 1,13,925, with increase in price, most probably huge short covering. FII’s bought 1.89 lacs Futures, which includes 12459 contracts long liquidation and 20011 contracts short covering, with decrease in net OI by 32470 contracts (includes 77740 longs to 70188 shorts for the day) and the Average Price comes to 8514.90. 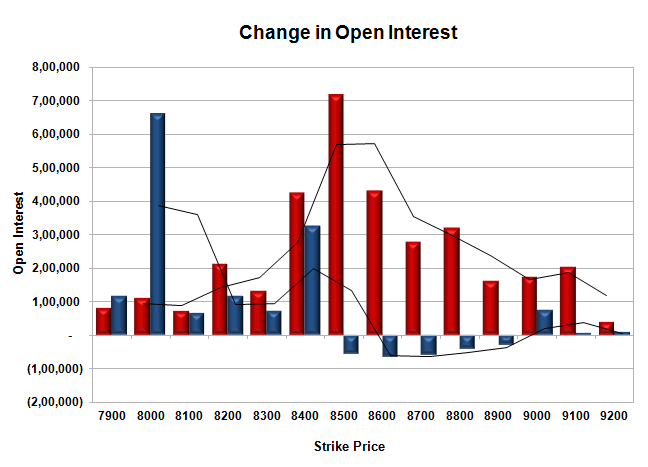 FII’s Index future open contract as on date is 502684 Longs to 126124 Shorts, net long 376560 up by 7552 contracts. 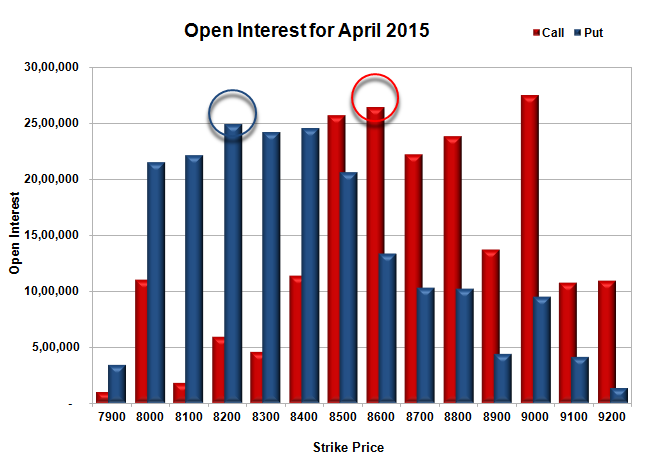 Initial support still at 8300, with OI of 24.15 lacs and below that at 8200 with OI of 24.94 lacs. 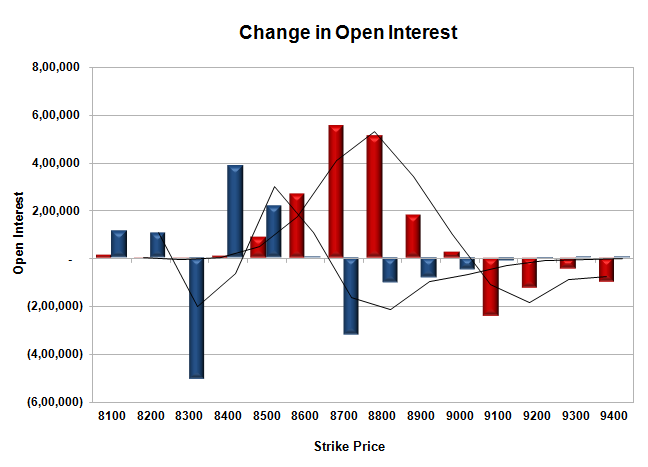 Initial resistance at 8500, with OI of 25.70 lacs and above that at 8600 with OI of 26.40 lacs. 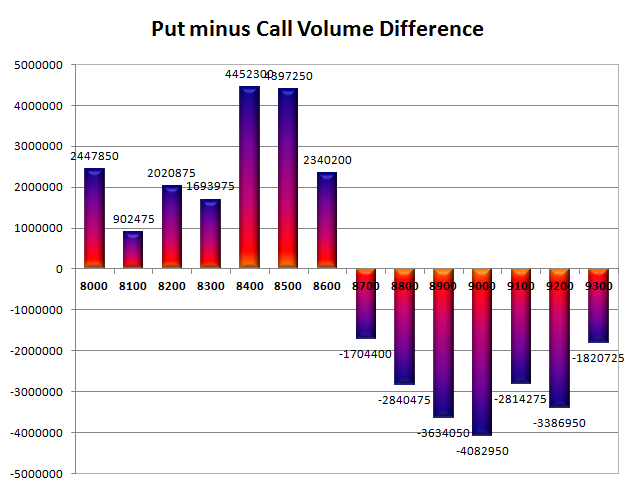 Day Range as per Option Table is 8257 - 8432 and as per VIX is 8278 - 8405 with 8341 as the Pivot. The Index though opened negative, but stayed more or less positive throughout the better part of the day but closed negative at 8542.95, small loss of 7.95 points. The broader market was also weak, with just 558 advances to 937 declines. Developing Range as per Option Table is at 8500-9000. 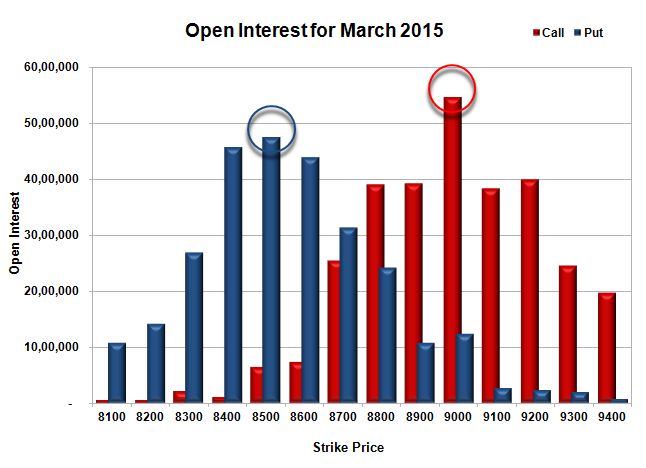 Call option 8500 added 3.20 lacs OI with profit booking seen at 8700 and above strike prices. 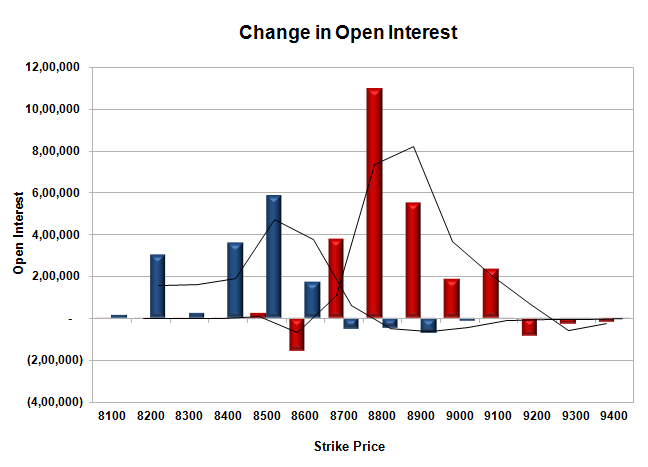 Put option 8600-8400 added 8.56 lacs OI with short covering seen at 8700 and above strike prices. 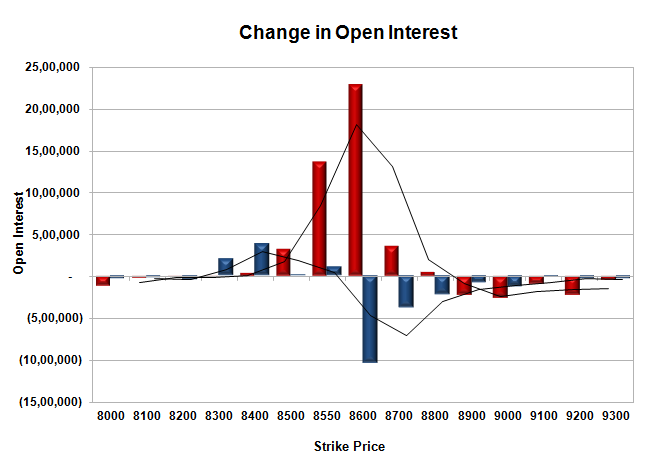 Nifty Open Interest is at 1,68,92,675 down by 50,91,750, whereas April series added 64.31 lacs with decrease in price, most probably 100% roll-over with huge short build-up. Bank Nifty Open Interest is at 21,18,975 down by 4,39,825, whereas April series added 4.64 lacs with decrease in price, most probably 100% rollover with small short build-up. FII’s bought 6.89 lacs Futures, which includes 43985 contracts long build-up and 16434 contracts short build-up, with increase in net OI by 60419 contracts (includes 352889 longs to 325338 shorts for the day) and the Average Price comes to 9017.33. FII’s Index future open contract as on date is 772775 Longs to 166978 Shorts, net long 605797 up by huge 27551 contracts. 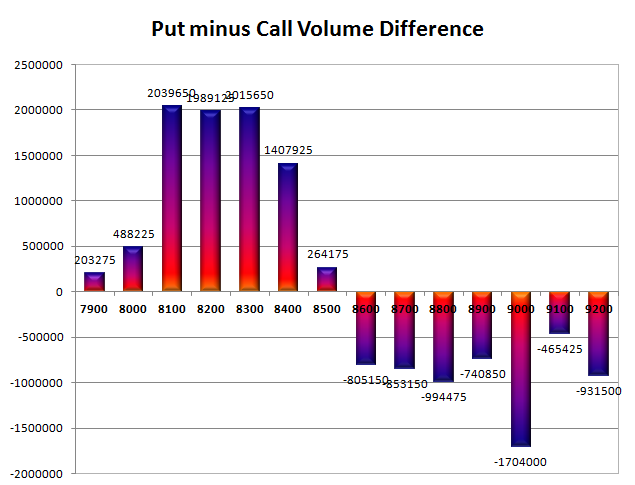 Initial and best support 8500, with highest OI of 58.51 lacs and below that at 8400 with huge OI of 46.23 lacs. 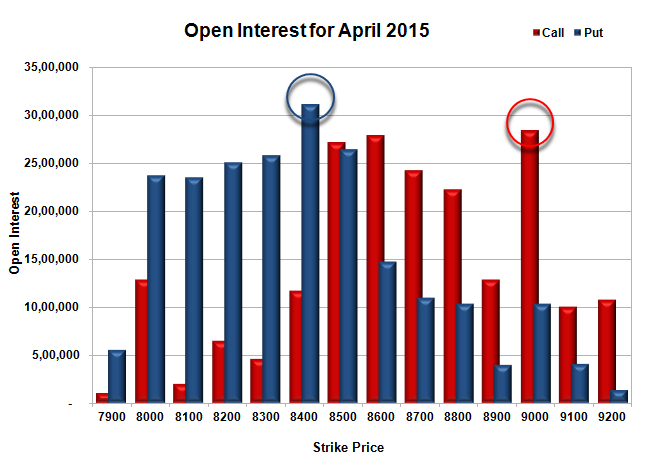 Initial resistance at 8700, with OI of 34.73 lacs and above that at 8800 with OI of 40.12 lacs. 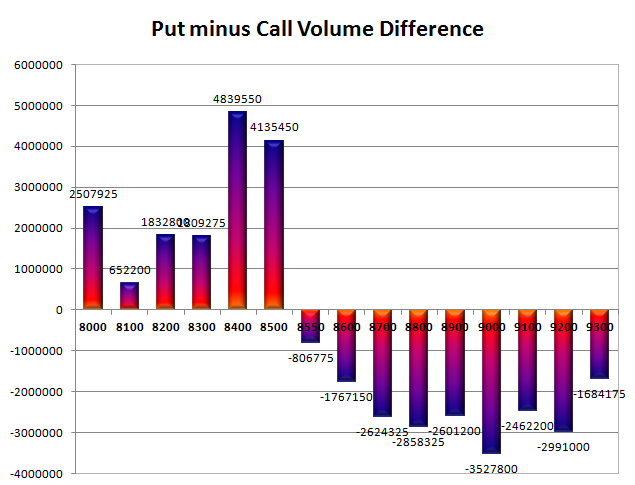 Day Range as per Option Table is 8482 - 8647 and as per VIX is 8482 - 8604 with 8569 as the Pivot. The Index opened positive above 8600 but saw selling pressure from the onset to move down to the lows of the day at 8540 but closed a tad higher at 8550.90, loss of 20.00 points. The broader market was very weak, with just 414 advances to 1108 declines. 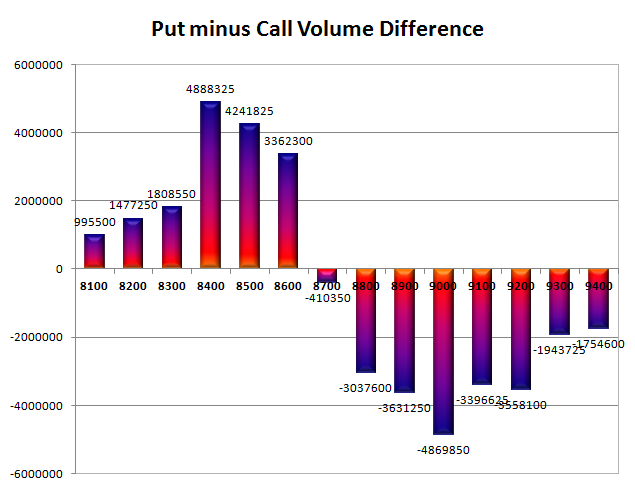 Developing Range as per Option Table is at 8500-8900. 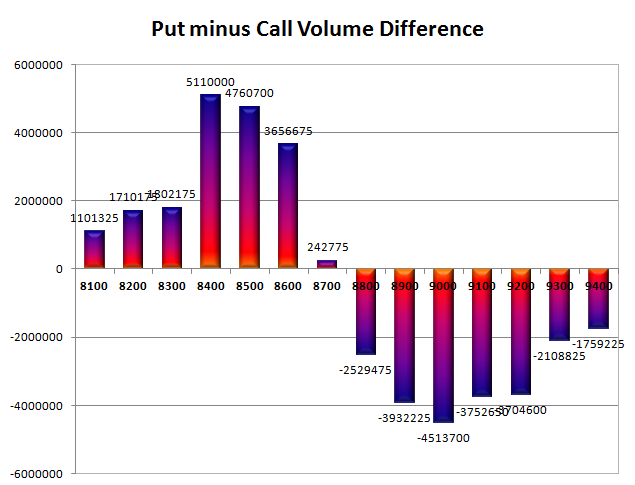 Call option 8500-8600 added huge 12.24 lacs OI with profit booking seen at 8700 and above strike prices. 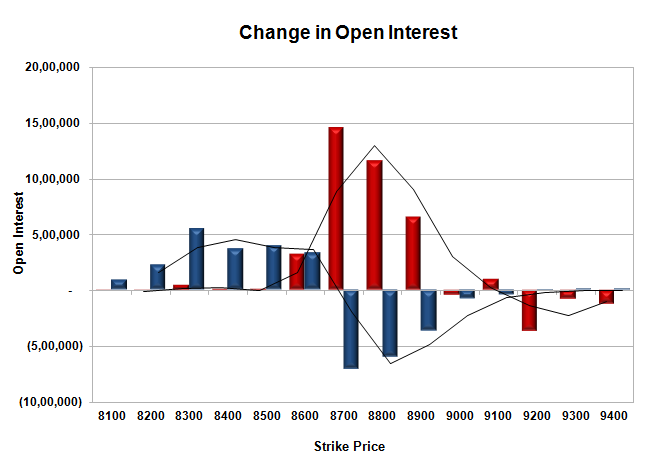 Put option 8500 added 0.54 lacs OI with short covering seen at 8600 and above strike prices. 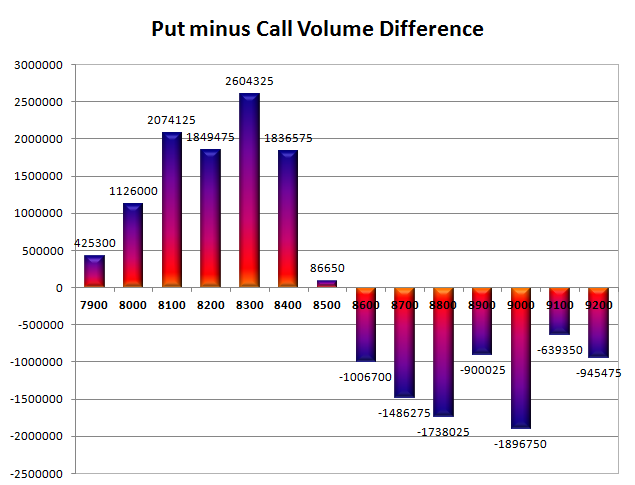 Nifty Open Interest is at 2,19,84,425 down by 9,12,925, whereas April series added 6.37 lacs with decrease in price, most probably 70% roll-over with huge long liquidation. 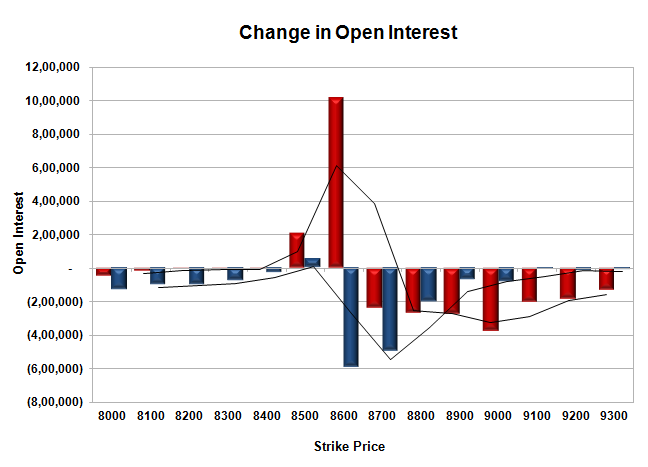 Bank Nifty Open Interest is at 25,58,800 down by 56,125, whereas April series added 1.80 lacs with decrease in price, most probably 100% rollover with huge short build-up. FII’s sold 4.49 lacs Futures, which includes 13584 contracts long liquidation and 4377 contracts short build-up, with decrease in net OI by 9207 contracts (includes 73408 longs to 91369 shorts for the day) and the Average Price comes to 8978.66. 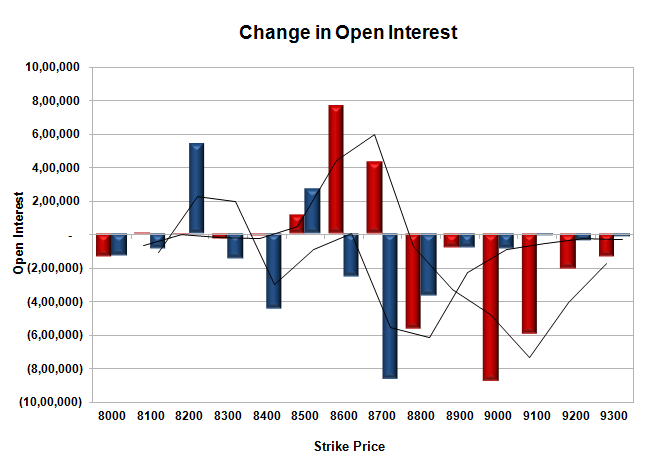 FII’s Index future open contract as on date is 728790 Longs to 150544 Shorts, net long 578246 down by 17961 contracts. 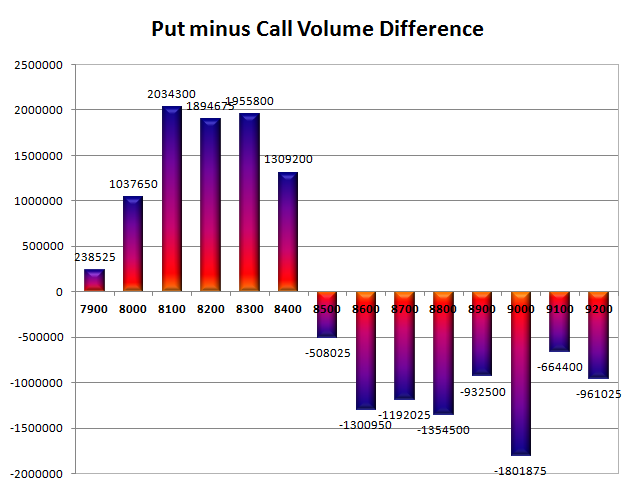 Initial and best support 8500, with highest OI of 53.12 lacs and below that at 8400 with huge OI of 45.67 lacs. 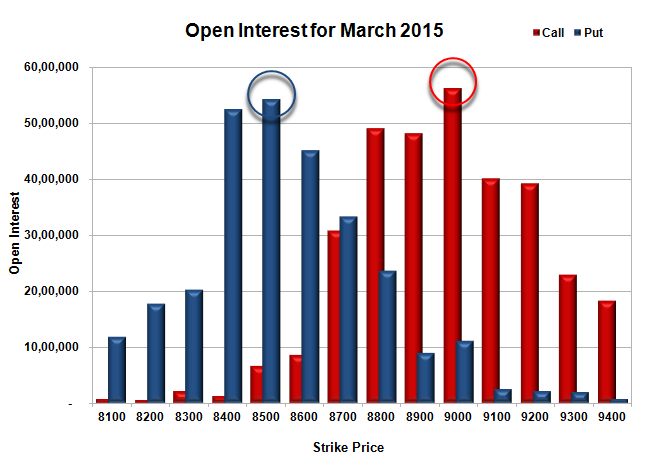 Initial resistance at 8600, with huge OI addition of 10.15 lacs and above that at 8700 with huge OI of 40.56 lacs. 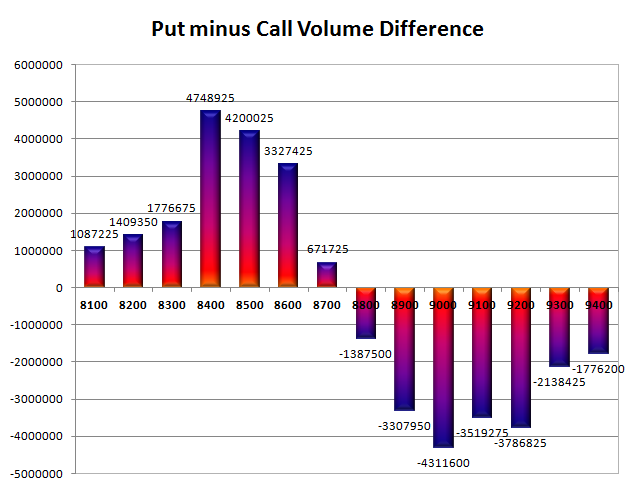 Day Range as per Option Table is 8481 - 8647 and as per VIX is 8487 - 8615 with 8567 as the Pivot. The Index opened up around 8743 but saw a small dip only to make a new high around 8747 but got sold off to the lows of the day at 8664 and closed just above at 8685.90, loss of 37.40 points. The broader market was also negative, with 667 advances to 848 declines. Developing Range as per Option Table stays at 8400-9000. 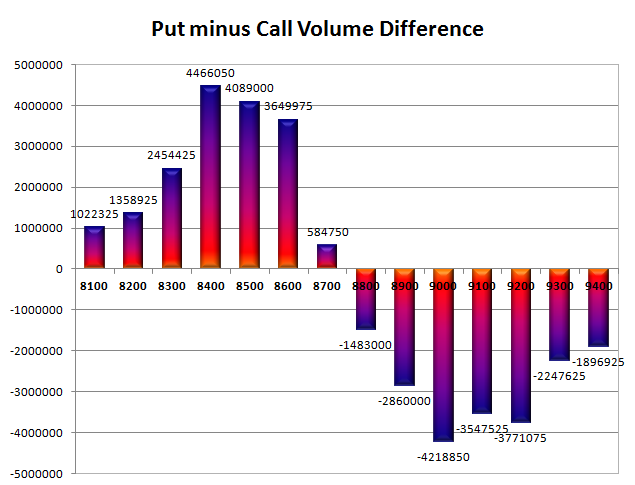 Call option 8700-9100 added huge 24.43 lacs OI with short covering seen at 8600 and lower strike prices. 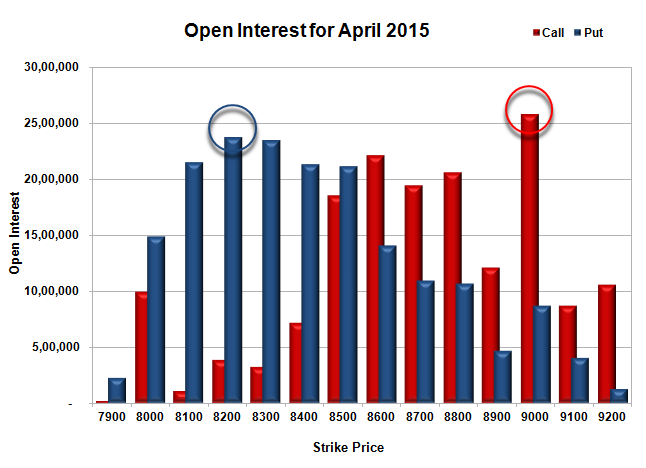 Put option 8600-8200 added huge 14.41 lacs OI with short covering seen at 8700 and above strike prices. 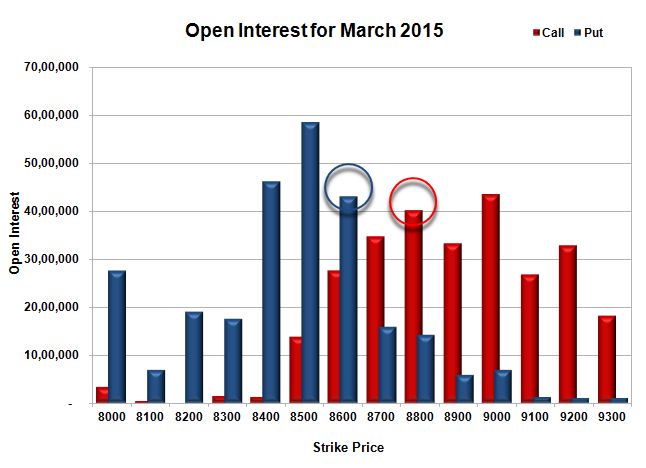 Nifty Open Interest is at 2,33,87,750 down by 7,43,875, with decrease in price, most probably huge long liquidation. 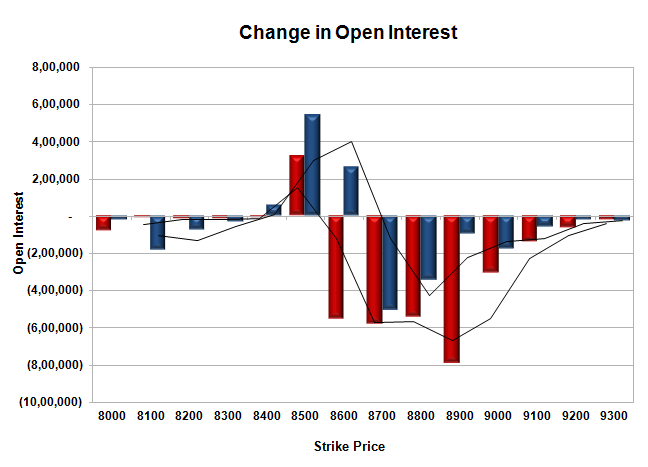 Bank Nifty Open Interest is at 24,63,550 up by 7,850, with increase in price, most probably long build-up. FII’s sold huge 6.72 lacs Futures, which includes 23529 contracts long liquidation and 3352 contracts short build-up, with decrease in net OI by 20177 contracts (includes 28358 longs to 55239 shorts for the day) and the Average Price comes to 8941.58. FII’s Index future open contract as on date is 743069 Longs to 126385 Shorts, net long 616684 down by huge 26881 contracts. 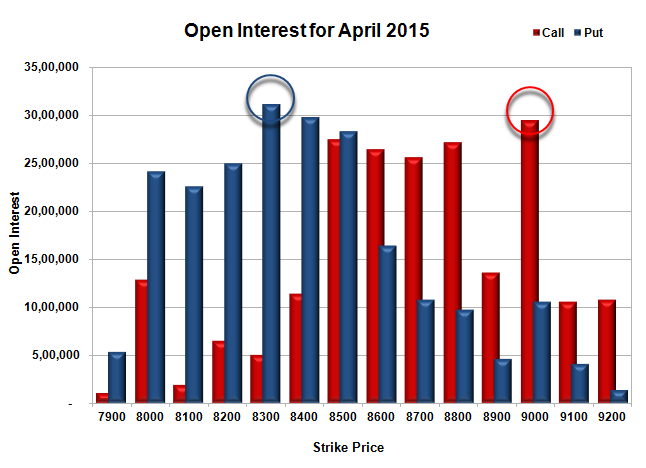 Initial support now at 8600, with OI of 45.23 lacs and below that at 8500 with huge OI of 54.36 lacs. 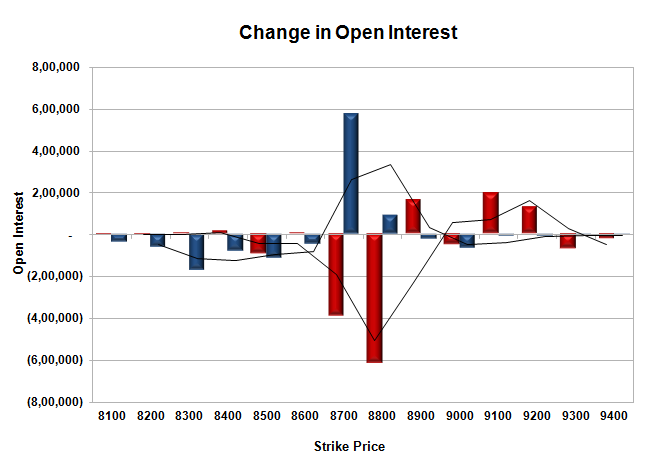 Initial resistance at 8800, with OI of 49.04 lacs and above that at 8900 with huge OI of 48.27 lacs. 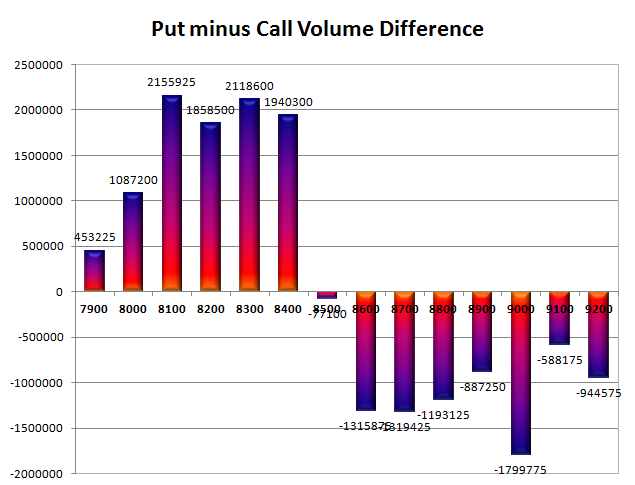 Day Range as per Option Table is 8613 - 8782 and as per VIX is 8615 - 8756 with 8699 as the Pivot. The Index opened flat to positive and stayed in a narrow range with mostly negative bias with every small up-move being sold-off to close the day at 8633.15, small loss of 14.60 points. The broader market was weak, with just 451 advances to 1078 declines. Developing Range as per Option Table stays at 8400-9000. 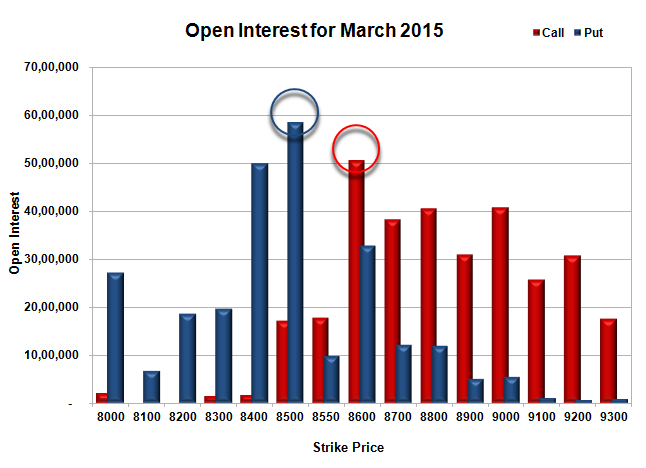 Call option 8600-9000 added huge 15.36 lacs OI with profit booking seen at 9100 and above strike prices. 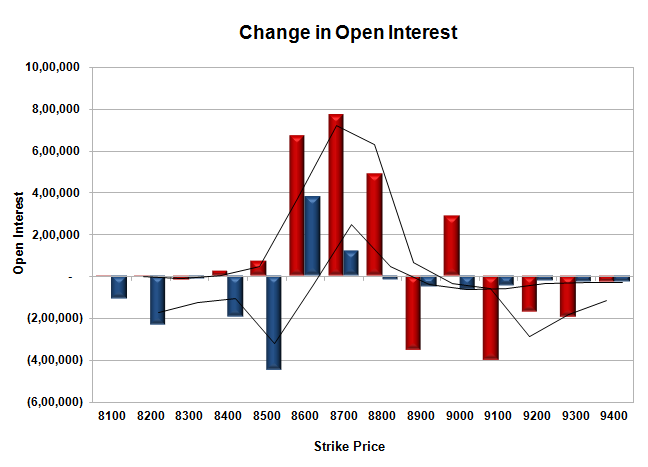 Put option 8500-8400, 8200-8100 added 8.25 lacs OI with short covering seen at 8700 and above strike prices. Nifty Open Interest is at 2,49,86,050 up by 3,06,275, with decrease in price, most probably huge short build-up. 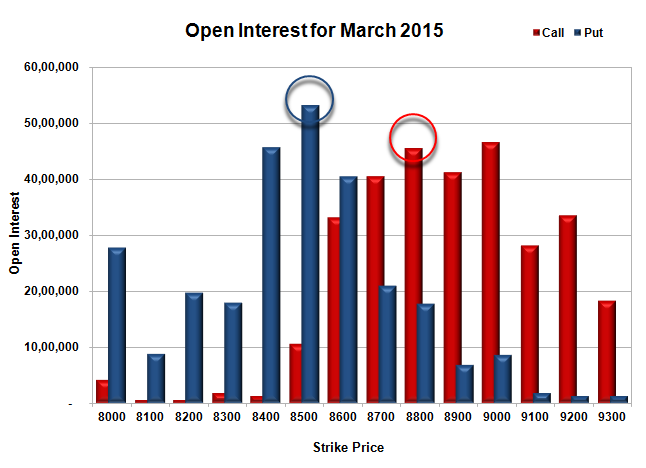 Bank Nifty Open Interest is at 26,54,950 up by 1,17,800, with increase in price, most probably huge long build-up. FII’s sold 1.99 lacs Futures, which includes 7584 contracts long liquidation and 401 contracts short build-up, with decrease in net OI by 7183 contracts (includes 46353 longs to 54338 shorts for the day) and the Average Price comes to 8857.08. 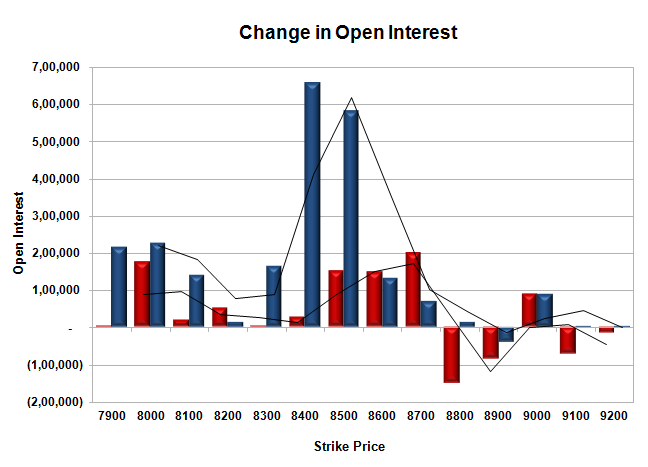 FII’s Index future open contract as on date is 787795 Longs to 122425 Shorts, net long 665370 down by 7985 contracts. Initial support still at 8600, with OI of 43.99 lacs and below that at 8500 with huge OI of 49.63 lacs. 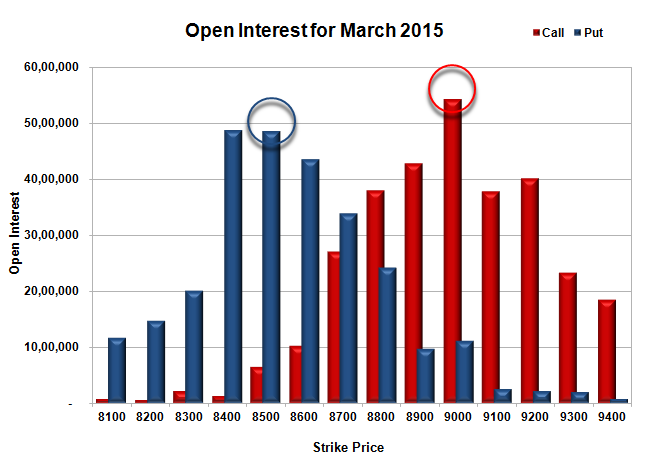 Initial resistance at 8700, with OI of 31.01 lacs and above that at 8800 with huge OI of 44.24 lacs. 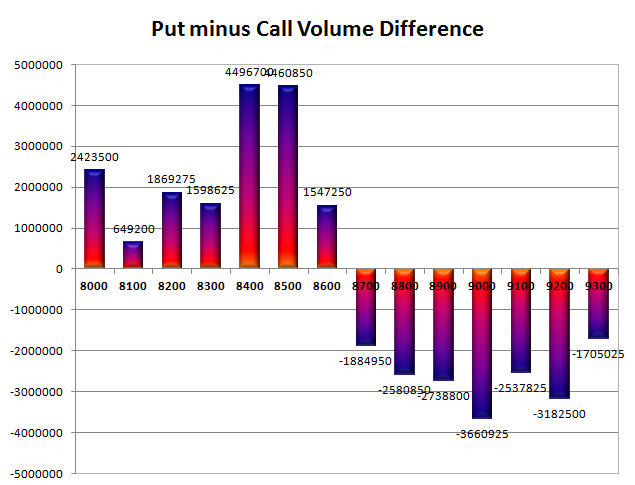 Day Range as per Option Table is 8549 - 8724 and as per VIX is 8565 - 8702 with 8636 as the Pivot.